Octopus Squid and Cuttlefish: Cephalopod Videos On the Web. Free and otherwise. Post in progress. Please suggest more videos! The clear winner. Interesting with more then amazing footage. 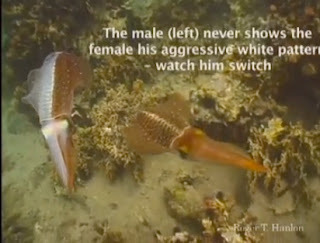 Discussion of the amazing flambouyant cuttlefish, squid mating, mechanism of color change. a very quick survey of all the cephalopods. I have read this many places online and did a small test using 4 seeds of Dioscorea Elephantis. After 4 months there was a clear difference between the underground and above ground seeds with the buried caudex being larger and much lighter in color. 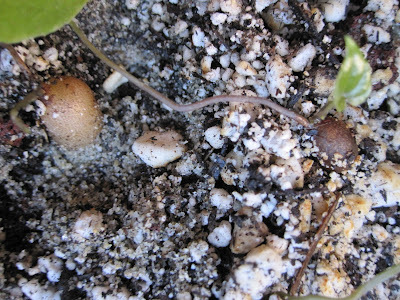 To better test this assertion that I have read on many webpages I am germinated 24 seeds of Dioscoreaceae Meixcana. I have not sorted out the complete plan but once I know how many germinate I will attempt to grow 4 to a 4" pot and randomize two per pot to being covered completely v. 50%. I will then follow caudex width, length, estimated volume as well as number of leaves and survival every 6 months. I don't believe I have all the info I need to do formal power calculations but I am certain that this number could detect the effect if it is as impressive as my experience with D. elephantis. If no effect is appreciated in this size that would be more then enough info to guide the treatment of these plants by fellow amatures. Suggestions?